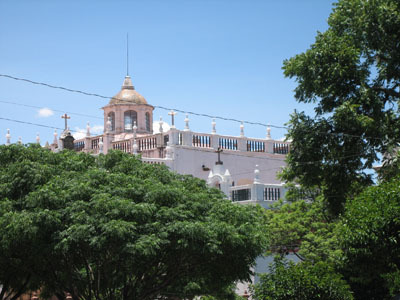 Next to the Plaza 25 de Mayo stands the Main Cathedral which was built during 1552 and 1712. The building that consists of three naves combines various architectural styles. The door facing the plaza and the main door are both from the 17th century. Both are made out of stone and very well decorated in a baroque style. The tower, also designed in a baroque style, consists of three parts, the uppermost of which is a pyramid. Its balconies are decorated with statues of the apostles and evangelists while its clock, which still works, was made in London in 1722. As you can only visit the inside with a guide, you first enter through the ecclesiastical museum. Here you can find a great variety of colonial religious art. 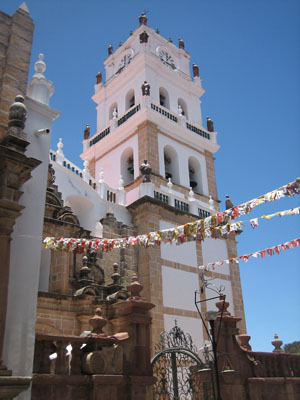 From here the guide will lead you to the chapel of the cathedral where you can find what is probably the most impressive part of the inside - the virgin of Guadalupe which is the religious patron of Sucre. Originally painted in 1601 by Fray Diego de Ocana, gold, diamonds, emeralds and pearls were added by believers as signs of their faith. Today the virgin has so much value that it´s one of the reasons why you can only enter with a guide. The bright inner of the nave is designed in an neoclasical way and painted in white with golden details. You can find a lot of details made of silver from Potosí like candle holders and altars.